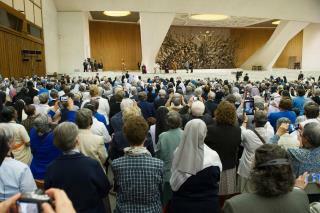 (Newser) – During a meeting with an international group of nuns on Thursday, Pope Francis casually mentioned that he's open to making the biggest change to women's role in the Catholic Church in more than 1,000 years. When one of the sisters asked about the possibility of a commission to look into having women serve as deacons, the pontiff said it was a good idea and it would be useful for him to have the point clarified, the New York Times reports. In the church, deacons are clergy who are allowed to preach and carry out weddings and baptisms, the Washington Post reports. They were important in the early centuries of the church but the role gradually withered from around AD500 onward, though the Second Vatican Council in the 1960s brought back permanent deacons and made the role available to both married and single men. (1 Corinthians 11:3) I want you to know that the head of every man is the Christ; in turn, the head of a woman is the man; in turn, the head of the Christ is God. (1 Timothy 2:12, 13) I do not permit a woman to teach or to exercise authority over a man, but she is to remain silent. For Adam was formed first, then Eve. (1 Timothy 3:1-5) If a man is reaching out to be an overseer, he is desirous of a fine work. The overseer should therefore be irreprehensible, a husband of one wife, . . . a man presiding over his own household in a fine manner, having his children in subjection with all seriousness (for if any man does not know how to preside over his own household, how will he care for the congregation of God?) The pope is not the vicar of christ ("earthly representative of God or Christ"). He's the antichrist who presides over one of the largest neo-pagan religions in the world. Look up the history of the Vatican. You'll see that it became apostate and then merge apostate teachings with Roman paganism to create the monster you know today as Christendom. One last scripture I'll leave you with: (Matthew 23:1-10) Then Jesus spoke to the crowds and to his disciples, saying: “The scribes and the Pharisees have seated themselves in the seat of Moses. . . . All the works they do, they do to be seen by men, for they broaden the scripture-containing cases that they wear as safeguards and lengthen the fringes of their garments. . . . But you, do not you be called Rabbi, for one is your Teacher, and all of you are brothers. Moreover, do not call anyone your father on earth, for one is your Father, the heavenly One. Neither be called leaders, for your Leader is one, the Christ. Christendom does everything exactly opposite to what the Bible says. If you would like to know more Bible truths please visit JW dot org. Why should we be amazed on something that most churches do already.